Bryce Canyon National Park images - stock photos & facts of one of the most beautiful and unique national parks in the United States. 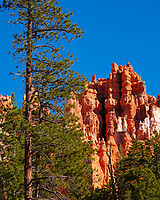 We have an incredible display of images of Bryce Canyon National Park that will capture anyone’s attention. Gander through photographs of its unique and grand hoodoos, as well as its natural, red rock arches. Appreciate the beauty of its abundance of local plant life, including wild sunflowers, evening primrose, the Wyoming Indian paintbrush, and douglas-fir trees. Experience the beauty of the park in all seasons, from blue and beautiful sunny skies to the sparkle of fresh, white snow. This is your perfect resource for discovering the grandeur of one of Utah’s greatest gems. 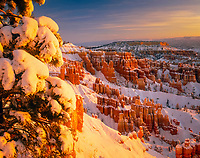 Bryce Canyon National Park is located in Southwestern Utah and consists of over 35,000 acres. 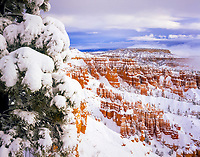 Bryce Canyon National Park was named after Ebenezer Bryce, an early Mormon Utah pioneer who established the area as his home in the year 1874. Despite its misleading name, it is actually a series of amphitheaters comprised of hoodoos. Hoodoos are tall, slender towers of rock that form in the base of a dry basin by frost weathering and stream erosion. 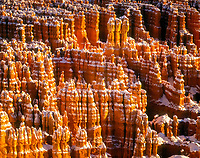 Bryce Canyon National Park is unique as it has the largest collection of hoodoos in the world. The hoodoos experiences deep color variation of its naturally red tone due to an abundance of different minerals in its natural rock and can change to bright shades of orange or even white. Hoodoos can vary greatly in height from only five and six feet tall to almost a dozen stories high. This U.S. national park experiences a high elevation climate. In its hottest summer months of July and August, it can reach up to over 90° Fahrenheit, but will regularly drop to below freezing temperatures in the winter. Although July and August are its hottest months, brief thunderstorms are common in the afternoon during this time. Weather is prone to frequent changes and it is quite common to have snowstorms in as early as October, or have thick snow still covering the roads in late spring. All of the amphitheaters in Bryce Canyon National Park are worth mentioning; however, its most famous amphitheater is the Bryce Amphitheater, which is in close walking distance to the park’s campsite. In addition, there are countless other viewpoints along the park’s 18 mile long main road which travels from the park’s entrance on the north side to its highest southern point. There are more than four hundred species of plants, including the rare Mountain Death Camas and the Watson Bog. Common animals include mule deer, elk, foxes, black bears, cougars, coyotes, and the endangered California Condor, Utah Prairie Dog, and the Southwestern Willow Flycatcher.